Wow…can you believe it? It’s the LAST Monday of 2014! All I can say is thank goodness the year is almost over! LOL!! 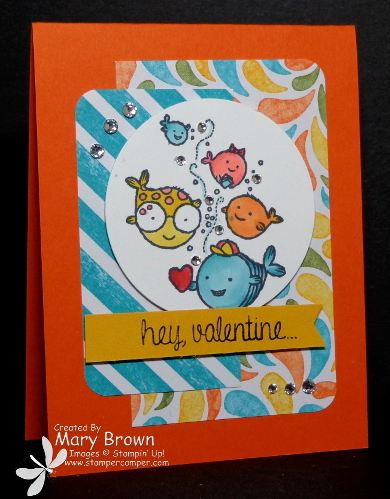 Mary Jo has such a GREAT sketch for us and I just could wait to use my Hey, Valentine set with it. I also thought the really cool dsp in the Birthday Bash Specialty dsp was a nice change from the Stacked with Love dsp Paper Pack! Today is also the last day of the Create with Connie and Mary Valentine Mini Collection so if you are looking for some GREAT ideas for this set and You + Me. Head over there and check it out! Only $5.95 for 4 exclusive tutorials – 2 card set and 2 3D items! Splash print (Birthday Bash dsp) – 2 3/4 x 3 1/2 – round right corners and add to card front. Bermuda Bay diagonal stripe print (Birthday Bash dsp) – 2 x 3 3/4 – round left corners and add to card front. Stamp fish on Whisper White using Memento Black. Color in with Blendabilities: Bermuda Bay, Daffodil Delight, Pumpkin Pie, Calypso Coral. Cut out with Circle Framelit and add to card front using dimensionals. Stamp hey, valentine using black on Crushed Curry 0 3 1/4 x 1/2. Cut into banner and add to card front using dimensionals. Wasn’t this great sketch for this set? I hope you can join the fun! Don’t forget to check out the other members of the team and remember go to the Technostamper blog to play along! This entry was posted in Create with Connie and Mary, Spring Mini, Technostamper Challenge and tagged Hey, Valentine. Bookmark the permalink. So cute, I can’t wait to get this set, I am imagining so many cute cards with it, love your color combo for this one. 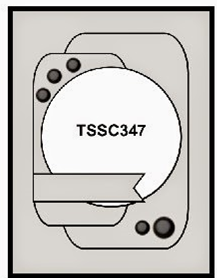 Darling, thanks so much for being on the TSSC team!